Take one peach that’s been sat in the fridge so long you’re sick of the sight of it (even though there’s nothing actually wrong with it) one narrow strip of left over puff pastry (from Charlotte’s courgette tart) and half a dozen raspberries out of the garden. 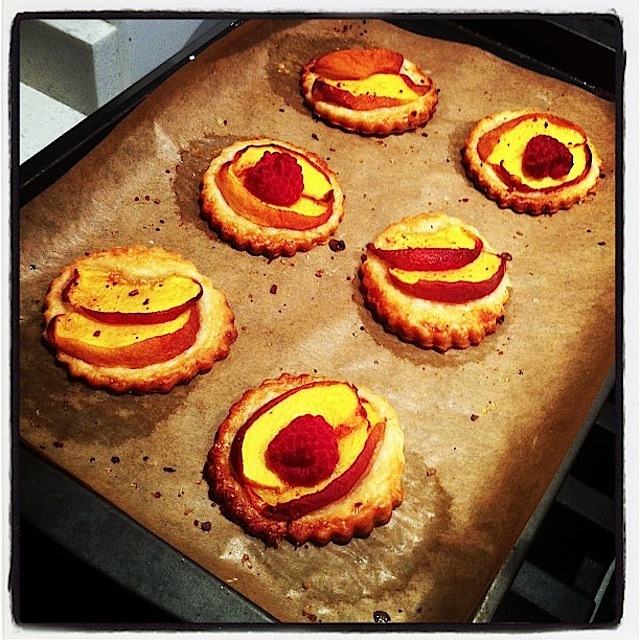 Cut the puff pastry into circles with a crinkly cutter and drape over slices of the peach with a raspberry. Add a sprinkling of sugar (or in my case a quick grinding of Lakeland cinnamon sugar). Bake at 200c for around 20 minutes. A speedy fridge diving dessert!